The UK and continental Europe could be gripped by more frequent cold winters in the future as a result of low solar activity, say researchers. Now begin the claims that whilst we are heading toward cold weather, it is man made and the result of 'Global Warming'. This is the reason why the term Global Warming has been replaced with 'Climate Change'. 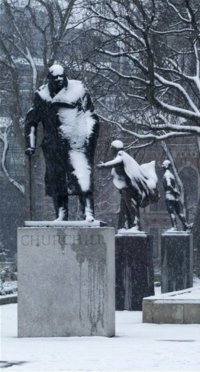 I predicted the forthcoming cold weather in the June of last year (2009), based on my very complex computer model. I don't expect anyone to really understand that complex issues, variables, and parameters that underpin this highly complex model, the important thing is that the blue line goes down and means that we are entering a 'Little Ice Age'. Expect 2010 to be just as cold as 2009, if not colder. It is getting warmer, honest. As usual the 'Climate Experts' claim that this is all a sign of the continuing Global Warming. "But they added that the phenomenon only affected a limited region and would not alter the overall global warming trend." Of course not, I am sure some places, like the Sahara Desert will remain remarkably hot and whilst the rest of the world freezes the climate fanatics will point out that the Sahara is now 0.03C hotter than it was 30 years ago! Also if these 'limited regions' do experience cold weather, as oppose to warm weather, can they still call it Global Warming? As surely the warming is no longer global. The UK Met Office is debating what to do with its long-term and seasonal forecasting after criticism for failing to predict extreme weather. This is quite amusing. The apparently independent Met Office, who predict all the weather in the UK, from the next day forecasts right up to predictions on ‘Climate Change’ some 20, 50 and even 100 years in the future; cannot actually predict anything. [The Met Office] has been criticised for failing to predict in its seasonal forecasts that the UK would suffer this cold winter or the previous three wet summers. Well, there is a very good reason for that isn’t there? They could not possible predict colder weather, when more than 25% of their budget comes from ‘Climate Change Research’! After being rapped for its now notorious “barbecue summer” press release, the winter forecast was expressed in probabilistic terms, with a 66% likelihood that the winter would be warmer than average and a one in seven chance that it would be colder. The Met Office admits its annual global mean forecast predicted temperatures higher than actual temperatures for nine years out of the last 10. Now why would that be? It has become almost like a religion, they believe it so much and think that if they want it hard enough, it will happen. The fact is that the Met Office has been over egging Global Warming for years, telling us that things are getting so much more worse and the new catch phrase of course of ‘Time Is Running Out’ but evidently not as quickly as the Met Office, or indeed the Hadley Centre, would like. SCHTOP! Global Warming is not ready yet! Crazy People: Some made use of the fact that the rivers were frozen by going for a dip or ice skating. Something rarely possible since the Victorian cold spell. The fact that they keep predicting that Global Warming is continuing apace, when anyone can see that it is not, displays quite clearly that the Met Office is no longer fit for purpose. It wouldn’t be so bad if they came clean and admitted they their predictions are wrong, but no, they are claiming that the actual temperatures are wrong and their predictions are right! Professor Chris Folland from the Met Office said a re-analysis of weather science might even show that the actual temperature measurements have under-recorded recent warming – making the Met Office forecast even more accurate than it appears. Quite right Prof Folland, this is indeed a warmer than average winter, my thermometers and indeed my eye sight are clearly under recording the weather! This is unbelievable, the man is clearly clutching at straws and refuses to believe anything that contradicts his doctrine. The man is not a scientist, he has become a preacher. But some scientists contacted by BBC News say the organisation needs to discover why there is a consistent bias towards warming, however slight. Money, pure and simple. They are the champions of a billion pound industry, and as I have said, they receive more than a quarter of their funding from the government to investigate Global Warming. You do not have to be Sherlock Holmes to realise that they might not be the quickest to pour cold water on the whole Global Warming nonsense. As I said earlier it has become a pseudo religion. It has been stated that we are building up to Thermogeddon, and that cannot, under any circumstances, falter or deviate from the pre-determined pattern of global warming. Like all good zealots, they are perfectly prepared to ignore, or as the Climate Gate emails demonstrated, doctor, any evidence to the contrary. Unscientific? As is adding this bias in the first place, it has nothing to do with science or even any real scientific methodology. They believe it should be warmer, so they add the bias, regardless of the facts. The short term forecasts are excellent. They should say the longer-term ones are highly uncertain, then keep modifying them. And this is the crux of the matter. Their short term forecast may well be excellent, but hell, even I can look out of the window and see a cloudy sky and know that it is likely to rain, and I am no meteorologist. The problem lies with their long term forecasts and they seem to rely completely on flawed computer modeling. Absolute rubbish. Computers cannot predict the future, nor can they predict the weather. They can only predict an outcome based on the variables and parameters that they are given. Now if the Met Office is adding the same ‘warming bias’ to these computer models, then obviously these too will be inaccurate. Worse, the margin of error will increase year on year and means that in 100 years, the warming bias will have carried the prediction to a ridiculous extreme. But I guess that is the problem with the Climate Change Creed. They know the outcome that they want, that they believe in, they just need to computer models to prove it. Easy, when you program in a bias to ensure thermogeddon. 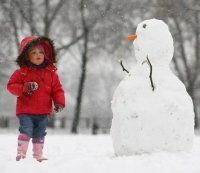 According to Met Office long term predictions, this snowman cannot exist, indeed this child should never have seen a snowman in her whole life. As Britain was due to be a desert by her 16th birthday. It seems that these days, one must look to independent forecasters to get any accurate or old fashioned truthful information. Others see the problem as one of forecasting rather than communication. Piers Corbyn, the independent weather forecaster, predicted the winter cold many months ago, to the surprise of many meteorologists. He says the Met Office failed to warn of extreme events in their seasonal forecasts because they are employing a computer model based on the assumption of man-made climate change. That is the point. They have already ‘predicted’ that it is going to get warmer, which means that all of the predictions of the Met Office are flawed. It doesn’t matter whether they decide to no longer publish their seasonal forecasts, their long term ‘Climate Change’ forecasts will still be wrong and they will continue to be more and more erroneous as time goes on. No wonder that more than half of people in Britain no longer believe in Global Warming. One of the world’s leading climate change research centres has been accused of manipulating data on global warming after thousands of private emails and documents were leaked. This comes as no real surprise to me. It is something that I have suspected for years now and although people often ask, why would they lie about it? I think that the answer is two fold. There are those that believe we should revert back to the dark ages, no electricity, no transport, and most importantly no modern luxuries – living simply as nature intended. Apart from the obvious flaws of this plan, the biggest is that we’d starve in our millions, but I think that that part might actually be part of the plan. The other reason is simply money. Nothing, ever, has seen investment like the Green lobby. With plans announced recently to have Climate Change forming a major part of the school curriculum and grants being given out left, right and centre, it looks as though the Climate industry may well soon surpass the IT industry in Britain. Children will soon be leaving our education system with degrees in topics such as sustainability, climate modelling, and saving energy. No doubt this will vastly increase the number of 18-24 year olds that are unemployed from 1 in 5, to 1 in 3. Not even the public sector needs that many sustainability officers. The email suggesting ‘hiding the decline’ is purported to be from Phil Jones, the unit’s director. The hackers here have clearly shown that the Climate Believers will stop at nothing to ensure that their theory is seen to be correct, whether the evidence backs it or not, and where it does not back their hypothesis, they will simply change it to fit. After all, like the Hadley Centre, they do not share the sources of their information, just in case they are proven wrong, or caught lying. When the people in charge of the data do not allow it to be inspected, indeed profit from the data backing their theories, then you no longer have scientific data or information, you have propaganda. British Isles to be Desert! The UK needs to plan now for a future that will be hotter and bring greater extremes of flood and drought, says Environment Secretary Hilary Benn. Each time this type of thing is announced it seems that they have to go further and further with their madcap predictions. This is a Government report conducted by the Hadley Centre, which was created purely to look at Global Warming and is completely tax funded. The Hadley Centre is part of the Met Office and accounts for approximately 13% of its staff, they are hardly going to start saying that Global Warming was a bit of a mix up and that mass redundancies are needed, now are they? No, with each report they have to go to crazier and crazier lengths to justify this cold spell and their very existence. Notice the dip sometime after the year 2000? Virtually right up to where we are now, and then the inexplicable jump later this year/early 2010? The fact is this is pure guesswork, if not wishful thinking. Temperatures have dropped and there are no indications of any kind of increase looming. They have covered their backs with large drops after 2010 and again after 2020, just in case there is no big increase, but after 2025 the guess work becomes quite fanciful. The problem with these kind of models is that they are all based on a certainty that the temperature will always increase, and these enviro-mentalists don’t even consider the possibility that the warming period may be over. Having a computer myself and being curious as to how this process works, I decided to create my own computer model. By feeding into my computer all the relevant information, dates, temperature and adding in pointless guesswork and bias, I set my computer to crunching the numbers. For some inexplicable reason my output was completely different to that created by the Hadley Centre, but then my very existence does not depend on the results. As you can see the computer was able to predict that we are in fact heading for a mini-ice age. Reaching its peak around 2024, the surface air temperature in the Northern Hemisphere will drop by a third of a degree, which may not seem like much but to steal a phrase from the climate freaks, could well be catastrophic. This is in direct contrast to the Hadley Centre’s predictions of an increase in temperature by nearly half a degree Celsius (they must have had their graph upside down!). Britain won’t have seem the kinds of temperatures like those in 2024 since the 1850s. We’ll be seeing frozen lakes, rivers and canals and perhaps a re-emergence of that popular pastime of ice skating on rivers and lakes. I for one, cannot wait. The UK Met Office, which led the scientific analysis, says UKCP09 is the “most comprehensive set of probabilistic climate projections at the regional scale compiled anywhere in the world”. Personally I don’t think that they are worth the paper that they are printed on. It is almost uncanny that model after model after model bears out the ‘scientists’ theories. Scientists collated data from 400 variations of the climate computer model developed by the Hadley Centre, part of the Met Office. I am guessing that if MPs were to create a computer model to discover whether they were giving taxpayers their moneys worth, the results would be pretty similar, i.e. the computer models would say that tax payers are getting a bargain! Needless to say that the enviro-mentalists are clapping their hands in glee at this report. “It’s great that the government has decided to put together such a scientifically robust analysis of the potential impacts of climate change in the UK,” said Keith Allott, head of climate change at WWF-UK. But why wouldn’t they? After all this mean millions, if not billions, are going to be handed out in Government grants to Climate Change groups in order to prepare Britain for an event that will never happen. By that time lots of people will have gotten rich from this cult. Britain to Melt and Crumble into the Sea – again! Global Warming in Action: No one, it seems, has released that to reverse global warming, we need only turn the timer upside down. In preparation for a potential heatwave this summer, people need to make sure they have a fair weather friend they can call on for aid, officials advise. Another summer, another attempt to make out that global warming is worse than ever or even upon us now. The hysteria peddled by the Ministry for Information seems to know no bounds in modern Britain. On the radio today during one advert break I was treated to no less than three Government information advertisements, yes three Government adverts in a five minute advert break. Last week during one of my infrequent trips to the cinema I was likewise treated to three Government adverts on a range of issues. The Malteser and Vodka adverts are to be expected, but should we really be having three adverts from our own Government before a film? I am sure that even Cubans would baulk at such blatant propaganda. It is amazing to think that even during a recession, when most businesses are curbing their spending on advertising, the Government is spending more than ever; and we are talking a hell of a lot. In the past decade the money spent on advertising by the Government has increased between 15-25% each year. This year the Government will pass Procter and Gamble as the UK’s biggest advertiser, spending more on adverts than anyone else. This year almost half a billion pounds will be spent on propaganda on everything from Road Safety, Swine Flu, Binge Drinking, Obesity, Smoking and of course Climate Change. It says homeowners can stay cool by painting their houses white and planting shrubs for shade. Painting my house white? I live in the Midlands, not the Med. No doubt I have seen more UK summers than the person who wrote that advice. If I wanted shade I’d step into the kitchen, and let’s face it, during the apocalyptic heatwave that we are facing, what kind of an idiot sits in the garden, even if it is under the shade of a shrub? Other tips include identifying the coolest room in the house. That shouldn’t be a problem, I daresay for most people, particularly the elderly, it is the room that they had to avoid all winter as they couldn’t afford to get it properly warm due to the sky high energy prices during the coldest winter in years. Yet they have been saying the same thing for years. Chances are that, like last year, and many years before apart from the couple of summers that caused this hysteria, it will be a typical British summer, warm, occasionally wet with a few hot days. My money however, is on 2009 being the coolest summer for years. Japanese scientists have made a dramatic break with the UN and Western-backed hypothesis of climate change in a new report from its Energy Commission. It is always good to see this cult taken down a peg or two. Most of these enviro-mentalists would have you believe that theirs is the only theory, except that they don’t call it a theory. For these zealots it is clear cut, there is no debate nor any discussion, and the media has largely towed the line. Those that do not follow the gospel are sceptics or worse heretics, so it is refreshing to hear the other side to this one sided debate. We are constantly told that the current rise in temperature is unprecedented, that it displays clearly to even those who are not climatologists, that the world is doomed. Yet, there is a precedent. This level of warming has happened before, many times, and all long before mankind was pumping out billions of tonnes of CO2. However, since 2001, this increase [in global mean temperature] halted. Despite this, CO2 emissions are still increasing. Another point that the enviro-mentalists don’t wish for you to hear about. Despite the increase in Co2 emission, the mean global temperature hasn’t increased since 2001. Yet still, day in day out we hear of the forthcoming Armageddon, just recently Chris Field warned that global warming was actually far worse than had been predicted. Prof Field said the 2007 report, which predicted temperature rises between 1.1C and 6.4C over the next century, seriously underestimated the scale of the problem. It seems that Field may be making this up as he goes along. Despite the apparent massive increase in CO2 emission the global temperatures have remained the same. I am no climatologist, nor even a Professor, but surely if the two are correlated, when one rises, shouldn’t the other? Perhaps I just don’t have enough faith? It strikes me as very odd that even though there is no further evidence for global warming getting worse, the enviro-mentalists have ramped up the rhetoric considerably. We are quite literally talking end of days for some, others aren’t so optimistic. For that reason, in 2000 Global Warming stopped, after that, the negative cycle will probably continue. I can’t help but wonder whether this is the reason. They are in denial. Despite the predictions of increasing temperatures, whole swathes of the world turning into desert, the oceans reclaiming parts of continents etc, all we have seen is a levelling out of the temperature for almost a decade. Global warming has ceased, worse than that though, it is apparently now reversing. A scenario that the countless computer models could never predict, because it is a possibility that was never allowed to enter the minds of those controlling the data, ever. Such a thought would be sacrilege, blasphemy even. Such people could not countenance a future where they were unable to save mankind from themselves, dictate to the masses how they should be living and point out the ills of their lifestyles. While skeptics are already using it as evidence of some kind of cooling trend, it actually illustrates how fast the world is warming. This from a an Associated Press article by Seth Borenstein. Yes, the world is getting so hot, so fast, that it is actually cooling! Such hysterical propaganda would have made even the Nazi’s hesitant, no so for modern media; factual inaccuracies and hyperbole be damned, they just print it anyway. This kind of scaremongering propaganda is all that is keeping the global warming movement going, evidence has long since ceased to matter to them and why should it when they have computer models that justify and bear out their theories, and when they have reporters more than happy to print their theories as fact. Fortunately the average person on the street is not as stupid as the global warming brigade believe them to be, so we can expect more and more panicked end of the world predictions over the next few years. Unfortunately I think that it is going to be many, many years before Greenpeace finally realise that they are not wearing any clothes. As this is the most viewed post on the blog (and written over a year ago! ), I thought I should add a poll to try and gauge what visitors thought of Global Warming. Thanks for voting and for reading. – Charlie. Summer is almost over and most people in Britain would be forgiven for thinking that it had never really gotten started. All this talk of global warming and yet around the world, things seem to be getting colder and colder. Apparently contradicting the predictions of extreme drought and the claims that action on Global Warming is almost too late. We’ve all seen the dire computer models, the ‘evidence’ that mankind is causing a global meltdown, even though this seems to defy common sense. CO2 makes up a tiny proportion of our atmosphere, and mankind is responsible for just a tiny proportion of that each year (less than 0.5%), yet it is ostensibly having such a catastrophic impact. At first I completely bought into this Global Warming business, after all the evidence was irrefutable, everyone agreed that Global Warming was real and furthermore, man made. Then I learned that the evidence wasn’t so incontrovertible and the more than I read the more convinced I became that the ‘evidence’ may not be all that it is cracked up to be. There are many, many scientists that are disputing the Global Warming phenomena. Over 100 sent a letter to the UN last year saying that cutting CO2 emissions was pointless. Recent events seem to have backed up my scepticism. Despite certainties that Global Warming was real and that the world is already suffering the affects, it has been getting colder, not warmer. Take 2007; Global Warming ‘experts’ explained that due to mankind’s inability to cut carbon emissions, 2007 would be the warmest year on record. It turned out to be the coldest year on record in many places, the coldest in living memory in most. There was snow in Johannesburg for the first time in 25 years, Baghdad for the first time in 80 years, and Buenos Aires saw snow for the first time in 90 years. This seems pretty odd considering that the planet is getting progressively warmer each year, at least according to the Global Warming champions. The fact is, despite the increase of carbon emissions, despite the claims and apparent obvious evidence of Global Warming, such as floods and hurricanes; the average global temperature hasn’t risen in a decade. That’s right, Global Warming peaked in 1998, but no one has yet had the courage to tell the Emperor that he isn’t wearing any clothes. The current hypothesis amongst true climatologists is that the planet is actually entering a period of cooling and that all the information points to this being a natural cycle in the planets climate and having nothing to do with man’s CO2 emissions. Of course, one swallow does not a summer make, and one cold winter does not mean that Global Warming is all a load of rubbish, but it certainly isn’t following the computer models that have been bandied about for years. Also this ten year blip in rising temperatures could just be the calm before the storm, and the next decade could see Global Warming continue apace. But people are not stupid, one bad summer and cold winter can be explained away, but two and then three…surely then even the most ardent believers in Global Warming are going to start to see the strings. Here is a quick look at the most popular posts of all time on the website, if you'd like to view a random post, click here. All this talk of global warming and yet around the world, things seem to be getting colder and colder. Apparently contradicting the predictions of extreme drought and the claims that action on Global Warming is almost too late. ...Read More. Who is the fastest ever white man, and is it possible to break the magic 10s barrier if you're white? ...Read More. Ray Mears must be rubbing his hands in glee now that the pretender to his throne of ‘Survival King’ seems to have been exposed as a bit of a nancy boy. It is mentioned several times that Bear Grylls served in the SAS, but let’s not forget that it was Ray Mears that taught the SAS everything that they know....Read More. Oh dear. The Lubyanka receives another inmate, albeit briefly. I am sure once he has been questioned he’ll be on his way to Siberia. ...Read More. john on Bear Grylls a fraud? A Squadron on Bear Grylls a fraud?